Umbria is known for its wonderful medieval hilltop towns and the undulating hills they perch upon. The capital of this beautiful region is Perugia, a city with a wonderful historic centre, out of which emanates a tangle of wonderful alleyways. 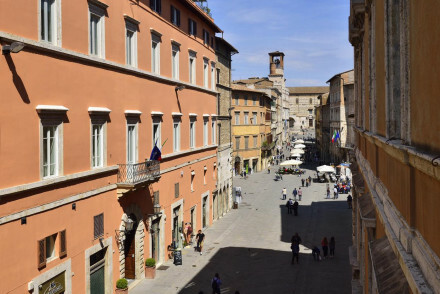 Some of the best places to stay in Perugia can be found along these cobbled streets; but if you’re looking for wonderful Umbrian peace and quiet as well as the bustle of this culturally rich university city then there are plenty of splendid options on the hills surrounding the city. As well as being known for its medieval art and architecture, Perugia is also known for its chocolates. And of course its internationally renowned Jazz Festival held in July, which makes for an interesting juxtaposition with the backdrop. During the summertime music fills the piazzas, but there is still plenty of cultural buzz if you come outside of festival time. Beyond that there are museums, more graceful squares, impressive galleries, hallowed churches, restaurants, cafes, as well as chocolate and gelato shops. Mmm, Italy. With so much to see and do in the area the best places to stay in Perugia are very popular so do plan ahead and book early. If you like the sound of the chocolates then you’ll want to visit the Casa del Cioccolato - which is an Italian chocolate factory par excellence. If you’re here for the art then you’ll find several of the greatest treasures in the Galleria Nazionale dell'Umbria, which spans history from the Byzantine flavoured 13th Century to Gothic and Renaissance works. If you’re interested in the architecture then the Palazzo dei Priori is a ‘must-see’, a Gothic palace with details more usually seen on a fortress, and ornamentation more usually reserved for churches or cathedrals. Compared to this castle, Perugia’s actual cathedral, the Cattedrale di San Lorenzo, looks rather stark and medieval, so it’s a great contrast and an equally fascinating place to see. The Basilica de San Pietro is more the sort of church you’ll be used to seeing in Umbria, a grand 10th Century mix of gilt and marble. 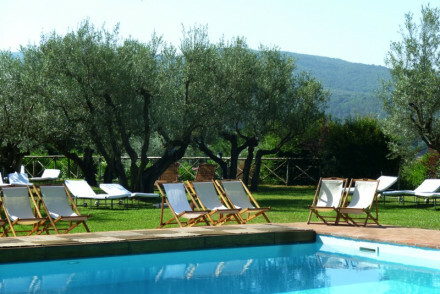 Close to Lake Trasimeno, the Country House Montali is a rustic country house surrounded by 25 acres of olive groves. There is a beautiful garden and pool as well as an award-winning restaurant specialising in vegetarian cuisine. Situated just a short distance from Perugia, but far enough away for it to feel like an escape. The Borgo di Carpiano is a carefully restored hamlet in the hills with ten peaceful rooms and suites. As well as the wonderful views, there is an infinity pool to enjoy them from. Tenuta Di Murlo boasts luxurious individually designed villas in an idyllic location with wonderful views of the area. Each villa features it's own private pool, whilst there is a golf course just a stone's throw away and lovely grub served up. Perugia is lovely in the summer, with the average daily temperature rising to 24°C in July and August. If you fancy a bit of bustle then this is the best time to come, with the Jazz Festival taking place in July and plenty of tourists still milling around in August. On the other hand, if you'd rather a quieter visit then consider coming in September. With an average temperature of 20°C, the weather's still perfectly pleasant for heading out sightseeing. International visitors can fly into Umbria International Airport, with Ryanair offering direct flights from London Stansted. Still not sure which is the best place to stay in Perugia for you? Browse through our list of all the best places to stay in Perugia. 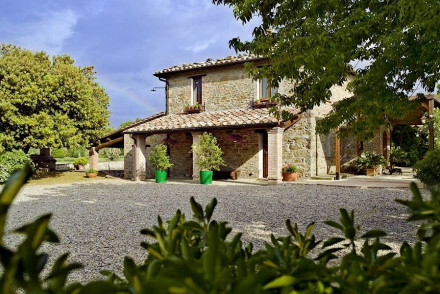 Expand your search to include the best places to stay in Umbria. 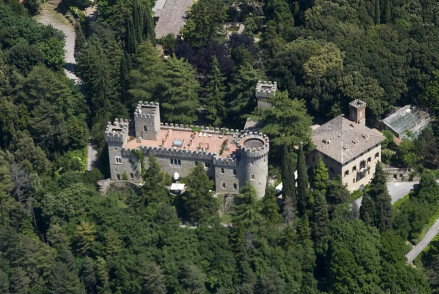 An enchanting castle-like hotel in Umbria set on a hill with charming valley views. A selection of traditional chic rooms, suites, or two-room apartments with balconies. 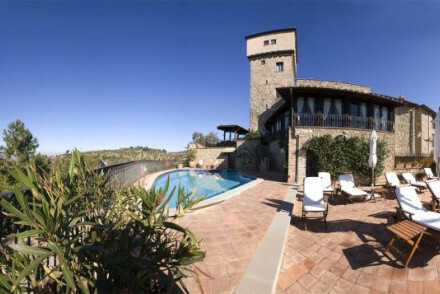 Fantastic Umbrian restaurant, an extensive spa, tennis courts, gardens and a pool. An ideal spot for an active country escape. Families - Three two-room apartments are perfect for families. Views - Lovely views over the valleys below.